Home » Featured » Nice Shelf Art or Good Bourbon? Nice Shelf Art or Good Bourbon? I bought this bottle a couple of years ago based on the way the bottle looked without knowing much about the bourbon itself. STOP!! Before you start in on me about buying something based on looks, be careful; we all have done it at one point or another. Maybe not with something as important as whiskey — you probably did it with something as trivial as a house or car, for God’s sake. Regardless, we’ve all done it; the difference is I’m not afraid to admit it. The good news is your chances of doing well based on appearances when buying whiskey are better than most things I can think of. The attraction was an unusual shape to the bottle; so I took a chance. Not only is the bottle an odd shape, it has a cool stopper that has a horse with a jockey on the top as well. Now that I have bored you to tears on the anatomy of this bottle and its very cool stopper and the lame reason why I decided to by it, I will lend a thought or two on whether or not it was a good decision. This is a single-barrel whiskey, which only means that they didn’t mix it with any other barrels before the bottling. The distilleries would like you to think that the master distiller grades every barrel, and passes ones that he feels as great into the single-barrel category. I don’t want to get on a rant here, but I think the single-barrel thing is more of a marketing tool than it is about the quality of the bourbon or a statement of the whiskey’s expression itself. I could be wrong….. One thing I can say about single-barrel whiskey is every one is a bit different so don’t expect one to taste exactly like another. The good news is they normally list the barrel number on the bottle so if you do find a barrel that you particularly like, it’s easy to track another one down. The first time I tried this whiskey I didn’t give it much thought, and I figured I just spent $45.00 on some nice shelf art. Normally blowing $45.00 on shelf art quite frankly would burn me up; but on the other hand, it looks much better than a lot of the cat stuff/cat paraphernalia the wench has adorned our walls, halls, and every other nook and cranny in our house with, so I didn’t feel that bad about buying it under the circumstances and quickly justified the purchase in my mind as a piece of art (yes, I consider Whiskey art), even if it did end up being bad. It wasn’t until the second time I picked it up that I realized that this was more than just a pretty bottle and very cool stopper — it was really good bourbon. 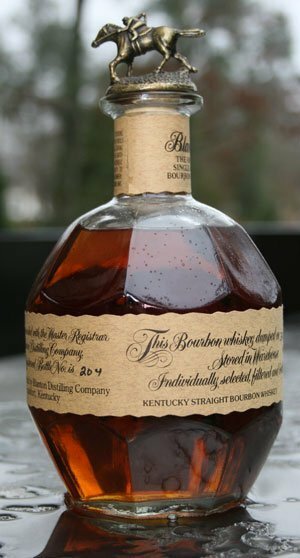 The nose on this bourbon is floral with strong vanilla/spice, with some beautiful oak-wood coming through, as well as some of the grain. There are times the nose on whiskey is quite different than what hits your tongue, but this bourbon doesn’t have any secrets. It is what it is; the taste is true to the nose. The mouth feel is a bit light, but very much what your nose passed on. It starts a bit warm and spicy, with the warm feel settling down very quickly, with the vanilla and wood immediately coming to the surface. The grain is a bit more subdued than what you first picked up when you breathed it in, but still rears its head to remind you it’s bourbon and nothing else. The finish is very nice, fairly long and spicy, with a residual vanilla end to it. While this bourbon is a bit on the lighter side, it still has all the classic character of really good bourbon. This is a good starter bourbon for someone who is wanting to get into fine bourbon for the first time. I certainly recommend this whiskey for all it has in terms of flavor and style, with the added bonus of a very cool bottle and stopper.